In the last decade, cash balance plans have experienced increased popularity among small to mid-size professional corporations and closely-held businesses. Their growth significantly outpaced the number of new 401(k) plans in the last five years, and they now account for 25% of all defined benefit plans in the nation. Last year, the Internal Revenue Service introduced changes that made cash balance plans more accessible and appealing to another segment of small business population, self-employed individuals. A solo(cb) plan was born. What is a Solo(cb)? A solo(cb) is a cash balance plan designed specifically for the self-employed individuals. Because solo(cb) is a type of a defined benefit plan it offers access contribution limits which may not otherwise be accessible in another retirement plan, such as a solo 401(k), SEP, or SIMPLE IRA. How does a Solo(cb) work? A solo(cb) plan in many ways resembles a 401(k) plan. For example, we speak of an ‘account balance’ (plan benefit) which grows from two sources: a pay credit and annual interest credit. Both pay credit and interest credit are outlined (or ‘defined’) in the plan document and are subject to IRS guidance: a $75,000 contribution credit (made by the company) and a five percent interest credit earned in the plan. Interest credit is guaranteed and independent of the plan’s investment performance. Because Solo(cb) is a type of a defined benefit plan, plan contributions are determined by plan’s actuary. 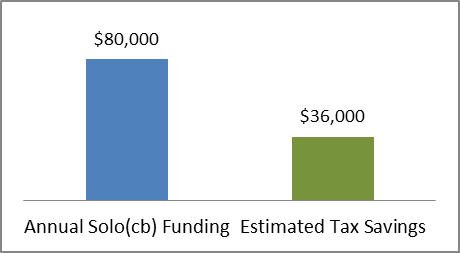 The amount of plan funding is driven by a number of factors including age, compensation history, interest rate promised by the plan, actuarial assumptions, and IRS regulations. When it’s time to distribute the funds out of the plan, the cash balance plan ‘account balance’ is typically moved to another tax-advantaged account, such as a solo(k) or an IRA, to defer taxation until distributions are needed. A word on non-owner employees: if a business has non-owner employees but none of them have ever worked 1,000 hours in a 12-month period starting with their date of employment, this business may be able to establish a solo(cb). When Does a Solo(cb) Make Sense? Looking to quickly diversify their retirement savings with contributions to a retirement plan account because their investment strategy to date may have consisted primarily of illiquid investments, e.g. real estate. Looking to sell their business on a tax-advantaged basis. Susan is a 47-year-old university professor who, in addition to her salary, receives a steady stream of royalty income from the books she’d authored and periodic fees from speaking engagements. She is able to direct up to $115,000 of her self-employment income into a solo(cb) plan. Because solo(cb) can be based on past earnings, Susan can effectively direct all of her self-employment income into the plan sheltering it from current taxation. John is a 40-year old commercial real estate agent. He has two goals: a plan that substantial contributions and a way to create a tax-free income stream in retirement. With a solo(cb) plan, he directs $80,000 per year for retirement on a pre-tax basis; a solo(k) plan which incorporates Roth 401(k) contributions and after-tax contributions paired with internal Roth conversion engine allows John make a $53,000 annual contribution that will grow and will distribute tax-free at age 65. For a successful self-employed individual, a solo(cb) may offer substantial advantages, including tax management, retirement income security, and risk mitigation. 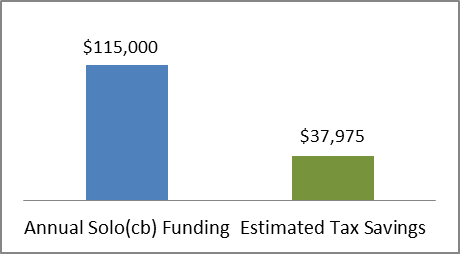 Paired up with a solo(k) plan, a solo(cb) can become a powerful engine for retirement distributions, combining tax-deferred and tax-free income sources. In addition to compelling retirement accumulation option, it may be successfully used to transition ownership of a business in a tax-efficient manner. For more information, visit our solo(cb) microsite. Retirement Services is available to consult with you concerning these and other retirement topics. The rules are complex and to succeed you need to either become an expert or align yourself with the right partner. We are available to be an extension of your team. Retirement solutions consultants are ready to partner with you in presenting solutions to your clients and prospects. But we don’t stop there; we help you implement and maintain the plan in partnership with nationally-recognized recordkeeping vendors to offer a complete plan solution. Call us at (888) 926-0600 or click here to connect online. * Assumes annual growth of 5% until age 65.